Be the first to share your favorite memory, photo or story of Marian Ruth. This memorial page is dedicated for family, friends and future generations to celebrate the life of their loved one. 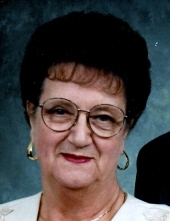 Marian Ruth “Pat” Robison, 90, of Clearfield, passed away early Tuesday morning April 9, 2019 at Colonial Courtyard in Clearfield. Born January 23, 1929 in Mineral Springs, she was the daughter of Oliver and Mary (Shaw) Hull. Mrs. Robison had been a housekeeper for the Morrison Family for 36 years. She was a Charter Member of the Fraternal Order of Eagles #812 in Clearfield, a member of the former Second Ward Volunteer Fire Company and was a member of the Golden Bison Alumni Association. She was affiliated with the Centre Grove United Methodist Church. On July 16, 1948 in Mexico. MO, she wed William Ralston Robison who preceded her in death on December 22, 2006. She was also preceded in death by her parents and a daughter Joyce Ann Robison on November 28, 2015. Surviving is a son Dennis Wayne Robison and wife Sherry of Clearfield; three granddaughters Jaydie Daub, Krystal Carlson and Adrienne Robison and her fiancée Ely Mantz all of Clearfield; two great grandchildren Eryn Renee Burkett and husband William and Randy Lee Reitz Jr. and wife Amber both of Punxsutawney; and four great great grandchildren Rylan, Commerick, Emma and Avery. To plant a tree in memory of Marian Ruth "Pat" Robison, please visit our Tribute Store. "Email Address" would like to share the life celebration of Marian Ruth "Pat" Robison. Click on the "link" to go to share a favorite memory or leave a condolence message for the family.